About Us – Real Estate Professionals of Destin, Inc. | Real Estate Professionals of NW FLA, Inc.
You’ll get the results you want with buying or selling in Okaloosa County when you use Mary Anne Windes, broker/owner as your real estate agent. Call me, Destin’s real estate expert, at (850) 837-2211. I can help you make the choice that gets the outcome you want. Do you need to sell your property for the most money possible with a Realtor® who meets all your expectations and more? Broker Mary Anne Windes is a life-long resident with more designations and qualifications than any other broker in Northwest Florida. Take the stress out of real estate. Call today! 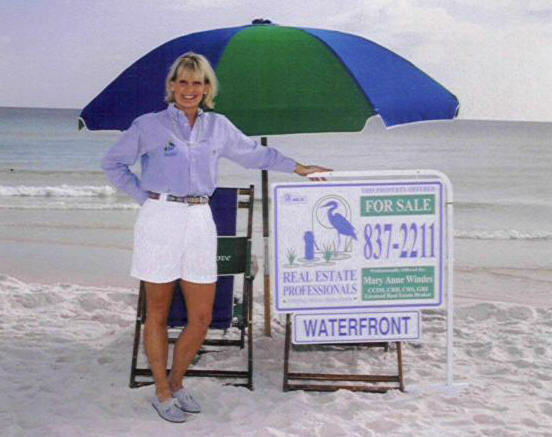 Hello from Real Estate Professionals of Destin and Real Estate Professionals of NW FLA. Our company is an independent, non-franchise real estate “boutique” brokerage specializing in the listing and selling of resort properties along the Emerald Coast. We are located on the Destin Harbor at the Destin Fishing Fleet Marina, the largest fishing marina and home of the top 40 charter fishing boats in Destin – the real Destin culture. We share our parking lot with Brotula’s Seafood House & Steamer, and you can find us 1/2 mile east of the Destin Bridge at 210A Harbor Blvd., Destin, Florida 32541. You can contact us easily at (850) 837-2211 locally or (800) 837-2266 toll free. Working on the Harbor, living in Destin, and leading the incredible Destin lifestyle is a way of life for us, and we’d love to share it with you. We’ve been doing it for over 23 years since 1994. Whether you’re looking to buy or sell real estate, our full time, experienced professionals can guide you through the maze of a real estate transaction. Our agents are highly qualified, experienced, full time professionals. What does that mean to you? Well, success mostly. Less hassles, less surprises, and a smooth transaction even beyond the closing table. Our company, small yet powerful, is well known, and the locals put their trust in us. They list their homes with us, call us for real estate counseling, and send us referrals. They know that we’re here today, and they can count on the fact that we’ll still be here tomorrow. Working with a Real Estate Professional has other advantages like we can recommend the best of the best in this area, but more importantly, we know the Destin real estate market and the best local real estate affiliates including lenders, appraisers, inspectors, and closing agents. If you want to work with a professional who really knows this area, then give us a call today! We provide free consultation with no obligation to both buyers and sellers with an honest, straightforward approach based on integrity, dedication and personalized service. Our doors are open from 9 – 5 Monday thru Friday and by appointment after hours. We hope you’ll come by and meet with us or call us at 850 837-2211 locally or 800 8367-2266 toll free. If you are looking to buy, we’d be happy to email or call you with new listings as soon as they come on the market. Of course, this service is absolutely free! And, if you have a home to sell, we’d love to share with you the benefit of our extensive advertising and listing services. If you’re like most people, the sale and purchase of real estate is one of the largest investments that you will make in your lifetime. You’ll be spending many thousands of dollars, so you owe it to yourself and to your family to hire a professional with the experience and knowledge to facilitate the transaction. If you are uncertain about the whole process, give us a call. We can walk you through step-by-step so there won’t be any surprises. Whether you’re buying or selling, we’re your one-stop, full-service real estate sales company. To join the hundreds of happy customers who have benefited from our services, please call us today at 850 837-2211 locally or 800 837-2266 toll free. Use the form below to contact us about your real estate needs.